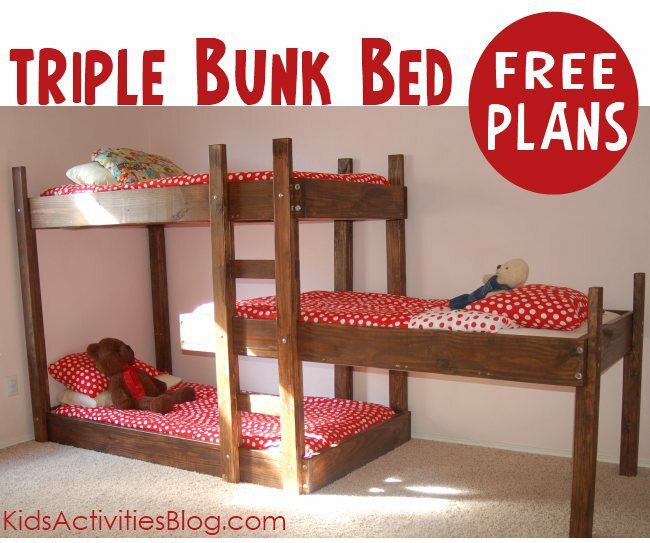 Loft or Bunk Bed plan and hardware kit giveaway! 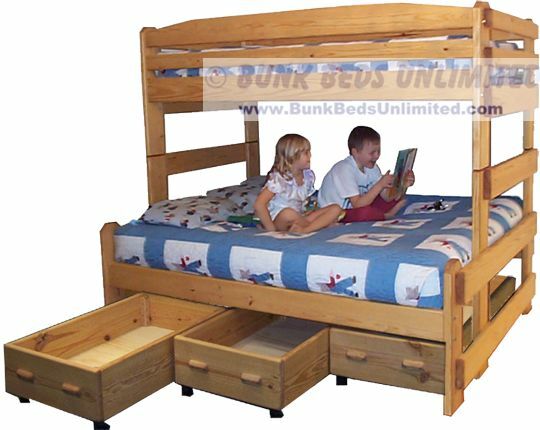 To celebrate September and Back-to-School, Bunk Beds Unlimited is offering a free plan and hardware kit (valued at up to $71.15) to the winner of our random drawing giveaway. The winner will receive a free (pdf) plan emailed to them, plus the hardware to build a loft bed, bunk bed, or triple bunk of their choice. And so... to enter this giveaway, you have three choices of places to enter! To enter this giveaway, you can: Comment, Share on Facebook, and/or Pin It on Pinterest. 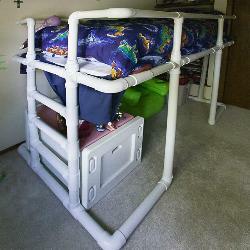 Comment on this post telling us what you plan to build, ie: loft bed for teen son, bunk bed for grandchildren, etc. Spread the word! Share a link to this post on Facebook. Then write a comment telling us you shared this post via Facebook. Pin a link to this post on Pinterest. Leave another comment letting me know you pinned it. You can do ALL THREE to have three entries in this giveaway! The deadline is September 14, 2013 at 12 noon EST. The winner will be announced shortly after that, on Saturday afternoon. Multiple chances to win! Enter now! This is the tall loft bed for a standard size twin mattress. 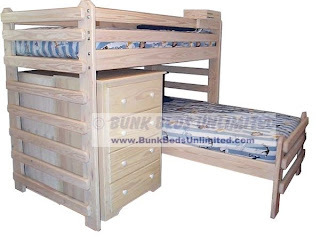 Bunk Beds – we have plans for several different bunk beds: standard bunk bed, stackable bunk bed, stackable twin over full bunk bed, L-shape bunk bed, and triple bunk beds. This is the stackable twin over twin bunk bed. 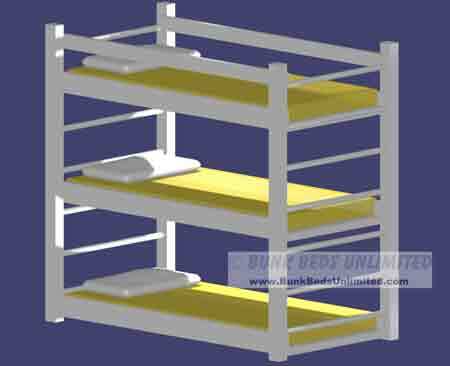 This is the stackable twin over full bunk bed. This is the L-Shape bunk bed, which is a loft bed with a twin bed underneath. This is the triple bunk bed which holds three standard twin mattresses and works very well in a room with standard 8-foot ceilings. The hardware kit we are giving away will include the hardware for building the bunk bed only (not the storage drawers or trundle that you could put under the bed). The winner of this giveaway will have the option of buying the hardware to add storage drawers or a trundle under the bed. How can a family of six live in a one-bedroom apartment? If you have children, then you probably have the same problem everyone with children has… organizing and controlling all their “stuff”. Raising six children for the last 28 years in a three-bedroom home, we have learned a few tricks that we would like to share with you. However, before I begin, I have to admit that I have a lot to learn and it was made abundantly clear to me by a recent customer. A family of six live in a one-bedroom apartment and she shared with us a video describing how they manage to do that with the aid of a triple bunk bed they built using our plans. Check out this short video for some motivation to simplify, organize and declutter; it definitely inspired me! How do you think your family of six could sleep in one bedroom? Please share your tips and tricks with us! It was 1963 and with six kids (five of them boys all in a row), dad and mom decided that a triple bunk bed was the answer to our overcrowded bedroom. Dad built the thing being armed with his own triple bunk bed plans and a few simple tools. I am sure that he got the basic idea from his times aboard naval transport ships during MacArthur’s island-hopping campaign in the 2nd World War, but how he came up with the actual design will always be a mystery. I will say that the plan for triple bunk beds elicited far greater enthusiasm than our burr haircuts did. Dad was a much better military barber than a furniture designer but he still built us an amazing bed. No one else I knew had anything like it and and my friends were envious. Even if it did not qualify as one of the wonders of the ancient world, it was absolutely kid-cool. What it lacked in safety features and structural integrity, it made up for in novelty. My best Rendition of my Father’s Triple Bunk Bed Plans (do not try this at home). The posts were made of 2-2x4s face joined with framing nails (no screws were ever involved in the bed’s construction). 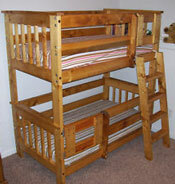 He made it with ladder ends similar to triple bunk plans that we now make available. The ladder was made from 1 ½” diameter closet poles that were sunk into the posts with the old-school cordless drill - a bit and brace. I still remember those closet poles flexing when I stepped on them on the way up to Joe’s bed which was on the top. They never broke and I never worried because dad built it, so I knew it must be alright. The thing that most disturbs me now is the way he built the mattress platforms. First of all, the bed was not as wide as a standard bed, it was only 32 inches which is the size of the hollow-core door slabs that made the mattress foundations. These were fastened to the bottom of the bed rails with framing nails. After a few years and a lot of growing kid activity, the nails began to pull loose. While resting in bed the platform would sag enough that we would be face to face with exposed framing nails pulled loose from the bed rails (yikes!). Dad’s solution to this problem was to put more nails in it. (Screws would have been better but it was a still a fundamental design flaw). This reminds me of the old saying that if the only tool you have is a hammer, every problem begins to resemble a nail. The mattresses consisted of cheap 4 inch slabs of foam that we bought from an upholstery factory. I remember going downtown with mom to get them. Mom covered the foam with sheets and they served pretty well for small kids. As our family grew up and the older kids moved away, more bedroom space was available so dad cut the bottom bunk off and made it a standard bunk which my brother James and I used it until were 10 and 12. James, my younger brother, kept his considerable collection of used bubble gum stuck to the post for later use. The old white painted wonder went the way of all flesh (along with the gum collection) when dad had it hauled to the dump and James and I got a new bunk bed from Sears and Roebuck. Despite its considerably flawed design and safety issues, we loved it. It was the coolest bed around and served our large family for years. Based on what I know it seems a little scary. Actually, it seems a lot scary. Times have certainly changed. If a triple bunk bed is in your future, why not spend a few bucks and get a plan that you can count on for safety and structural integrity. If the $9.95 is really a burden, I invite you to contact me and I will see if I can help. Happy Father's Day to all fathers everywhere who are trying to do the right thing. Do you know how to determine if a bunk bed is safe for your children? 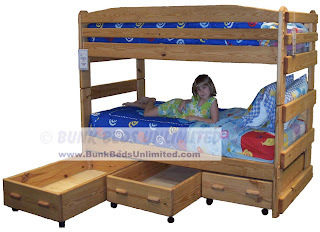 Bunkbeds are a great solution for children's bedroom sleeping arrangements, but safety first, right? There seems to be a serious need for safety in the discussion of bunk bed plans available online. There are many, many plans to build bunk beds of all types but the idea of the federal safety laws outlined by the CPSC never seem to enter the discussion. (If you would like to read the CPSC ruling, click here.) Many of the plans that we see on Pinterest and other sites that show off ideas look great, but I would NOT let my kids sleep in them. Would you? The safety laws were adopted for a reason - to ensure the safety of children. All of our beds are designed to comply with the CPSC rules for safety. If a plan that you are considering using does not address these rules, then it is probably a fair bet that those plans would not meet the rules. I understand that unless you are a manufacturer, the laws do not apply. But doesn't common-sense? As parents, we do everything in our power to ensure the safety of our children during their waking moments, so where they sleep every night should also be considered. Let's discuss falls first. There are falls that occur when a child is climbing or playing on a bunk bed and falls that occur during sleep. Of course, the CPSC cannot prevent the type of horseplay that causes kids to fall when climbing or being silly. In all honesty, we have NEVER had any of our six children fall from any of our bunk beds. We have had two or more sleeping in our bunks for about 17 years and they have never fallen. That includes when climbing and while sleeping. There are no guard rails, but it is FREE! The falls that occur during sleep because there are no, or inadequate guard rails, to protect a sleeping child are completely preventable. Until December of 1999, bunk beds were not held to the standards that they are today. Bunk and loft beds did not even have to have guard rails in many instances. 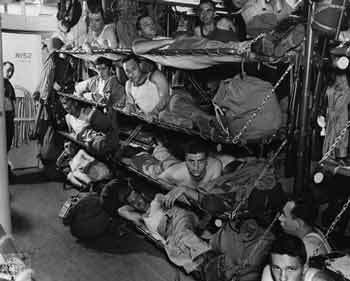 Others had only removable rails that just sat on the top of the posts or abbreviated guard rails that covered only a part of the top bunk. With the CPSC rules this changed. The law for manufacturers now mandates that the guard rail extend the full length of the bed (except in the space necessary for a ladder) and that they extend above the mattress at least 5 inches. These rules are in place to prevent falls and entrapment. Guard rails can cause an entrapment. Now the biggest danger is entrapment. This is just what it sounds like - a child becomes entrapped in the structure of a bunk bed. Did you ever get your finger stuck in something and had great difficulty getting it out? Entrapment in beds is a bit like this, but when a child’s head or neck is entrapped, the outcome can be, and has at times been fatal. We don't want you to be overly fearful about this; bunk beds that adhere to the governmental laws pose no threat of entrapment for your children. 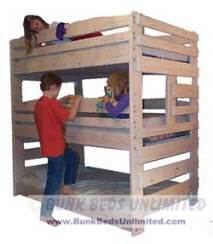 We now have CPSC federal laws for manufacturers of bunk beds. These laws are a result of a study of the science of anthropometry. This is the science that proves that humans move differently than Gumby. When applied to a bunk bed plan, you can come up with a design that is safe, functional and looks good too. If a bunk bed plan does everything you ever want it to but is unsafe it fails the first test. Having said all of that, I would like to show a couple of pictures that make my parental instincts boil a bit. These are beds that people are representing as great solutions for children’s sleeping arrangements. What do you think? Guard rails are not safe. This is being sold as a toddler bunk bed plan. the rails with the exception of his head.